When you're writing a blog post, chances are you have a process that you follow. You know the topic of your post, and have a general outline of where all your super awesome knowledge is going to fall on the page. And, I'd bet that your process is probably very different from the next gal that will read this post after you. But one thing that each of us do at some point in our process, is come up with a title for our new content. But, how much effort do you put into it? Do you slap a general title up there, or do you thoughtfully construct an attention-grabbing headline that will keep the new readers comin'? The truth babe, is that your headline is easily the most important part of your entire blog post. 4 out of 5 people will read your headline, and on average, only 1 of them will click through to read your post. That means that you have to put some serious energy into making that title as interesting as possible. We know that cohesive blog posts help readers trust our knowledge. And a clear starting point will anchor our entire post. 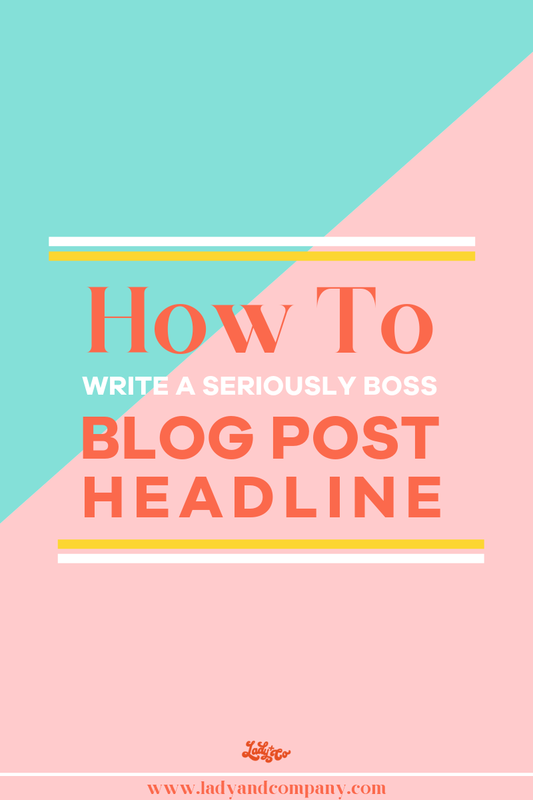 So, by creating your headline before you even start to write the body of the blog post, you will give yourself a solid reference point and overall topic to stick to. I'm talking clickbait titles- just don't do it. Not only is it a surefire way to up your sites bounce rate (google will seriously dock your rank for this), but it also will cost you the trust of an otherwise perfect reader. Instead, use your headline to make a promise to your readers. Tell them that by the end of reading your post they will be more knowledgeable about ____ or that they will learn how to ____. Use your headline to establish yourself in a position of wisdom. As with all things in your business, you have to appeal to a very specific demographic. By knowing exactly who you are writing for, you will know how to construct your headline. It will help you with your verbiage, your topic, and your voice. This is where your personality can shine through to hook readers. Don't be afraid to be unexpected or even a little trendy if thats your jam. Jazz up your headline with some really juicy words that will cause some sort of an emotional reaction out of your readers. Use a thesaurus app or search google for some synonyms if your struggling. It can be the difference between "10 Fast and Good Dinner Recipes" and "10 Tasty Recipes You Can Cook in 30 Minutes or Less"
People are always looking to learn how to do new things, and learn them quickly. So writing a blog post that will teach them something new in a short period of time (i.e. how long it takes to read your blog post) is sure to lure in new readers. 2. Why _______ is _______. Readers like to see new and fresh perspectives on common things. This type of headline will do exactly that. 3. What Every _____ Should Know About _____. This headline will target a very specific type of reader and grab their attention by informing them that they should know exactly what it is you're about to tell them. We all love a good list. They are easy to read and get the point across quickly. Breaking down your post into bullet points will pull in more readers. 5. The (Adjective) Guide To ______. This is another great title to use to show your readers how knowledgeable you are in your field. And using a juicy adjective will grab their attention! 6. (Number) Ways To Avoid _____. It's known than people have a stronger response to negative statements. Plus, nobody likes making mistakes so they are likely to look for ways to avoid them. -24 Ways To Avoid Spending Your Whole Paycheck On Bubble Tea- Again. These headline templates will be super helpful in creating rich content for your readers, as well! Yeah, babe, blog post titles play a surprisingly important role in getting new eyes on your posts. I promise that when you start putting intention into your headlines and improve your content, your blog reap the rewards. What do you struggle with most when it comes to writing an attention grabbling blog title? Which headlines always catch your attention?